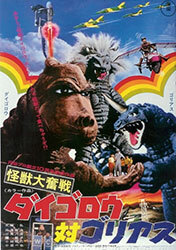 Daigoro is a teenage kaiju who lives on an island with his trainer and a group of scientists. He was put there after his mother was destroyed trying to defend him. As he grows, he’s eating more and more food and costing the government too much money. They want to put him on a growth-suppressing drug. His trainer balks at the idea. Meanwhile, a strange object crashes into the sea nearby, and a hulking monster with an electrified horn rises from the deep. 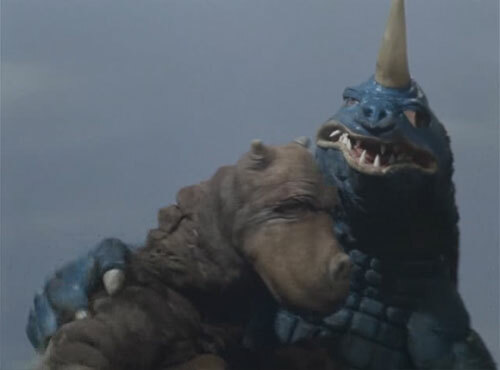 Your enjoyment of Daigoro vs. Goliath is in direct proportion to your ability to tolerate the silliest nonsense of kid’s movies. I understand that a movie for children might be less intense or grim (or at least that is the popular perception of what kid’s movie should be), but Daigoro vs. Goliath undercuts any moment of excitement or danger with a wackiness that is more grating that it is humorous. What little dramatic investment is available comes from Daigoro’s friend/trainer, an earnest guy who just wants to keep the monster fed, but is under pressure to administer a drug that will keep Daigoro from growing needing to consume more food. The rest of the human subplots follow a goofball inventor and an alcoholic who eventually fall into Daigoro’s orbit when his nemesis, Goliath, arrives to kick over some buildings and blow stuff up. oh, oh, wait... I'm so sorry." Once the monsters are on the scene, a kaiju film usually picks up the pace. Daigoro vs. Goliath isn’t interested in pace, and instead, continues to drag things out. Goliath (or the Great Stellar Monster as he’s referred to in the film) was originally planned to be Godzilla, but Toho wisely decided to put a stop to that. He is not a terribly designed kaiju, and he would not be out of place in a later Gamera movie, but he’s not particularly interesting either. He’s just a big green pig-nosed lizard with a horn on his head that shoots lasers. Goliath should be an omnipresent and almost faceless threat to the much more cartoonish Daigoro, and within those parameters, he works just fine. Daigoro, looks like some kind of hippo/walrus monster with accordion arms. The design is almost as unsettling as Minilla, Godzilla’s son. He’s not the absolute worst looking kaiju I’ve ever seen, that distinction goes to Kong from King Kong Escapes (1967), but for a main character, I didn’t find him very endearing. Far more successful is Daigoro’s ill-fated mother, who only appears in a flashback. With her mass of white writhing hair, and much more monstrous face, she strikes a much better balance between scary monster and something more kid friendly. "Bye everyone! See you in the sequ... wait, we did that joke already." The miniature work is largely acceptable, if uninspired. Most of the action takes place on a beach or in the ocean; places relatively simple to execute on a sound stage. We are treated to yet another oil refinery attack, giant monsters seemingly can’t resist stomping all over them. The actual battles between Daigoro and Goliath are weak, as they build to a overly complicated climax where it’s down to Daigoro believing in himself, while our trio of dumb humans attempt to cover Goliath's horn with a cloth. 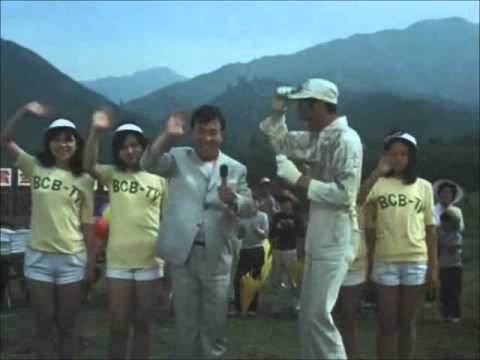 The 1970s, Godzilla films are often criticized for being kiddie-fare, and those criticisms aren’t unfounded. There is definitely some diminished storytelling here, with greater emphasis on tepid slapstick and selling toys. Still, most of the later Godzilla films are still enjoyable on some level, Daigoro vs. Goliath shows just how much worse it could have been.